This history of mixology is riddled with dubious tales of origin, of outlandish claims made by notable barkeeps, of contradictory accounts. But one notorious cocktail (which, by the way, is technically illegal to serve in several American states due to the fact that it requires the mixing of two liquors in one beverage) about which much is known is the elusive Vesper Lynd. These ingredients are to be shaken over ice and strained into a chilled cocktail glass. The glass is then garnished with a lemon twist. The final product is exquisite in both flavor and appearance. The qualities of the cocktail itself, however, are eclipsed in interest by the story surrounding the drink’s popularity. 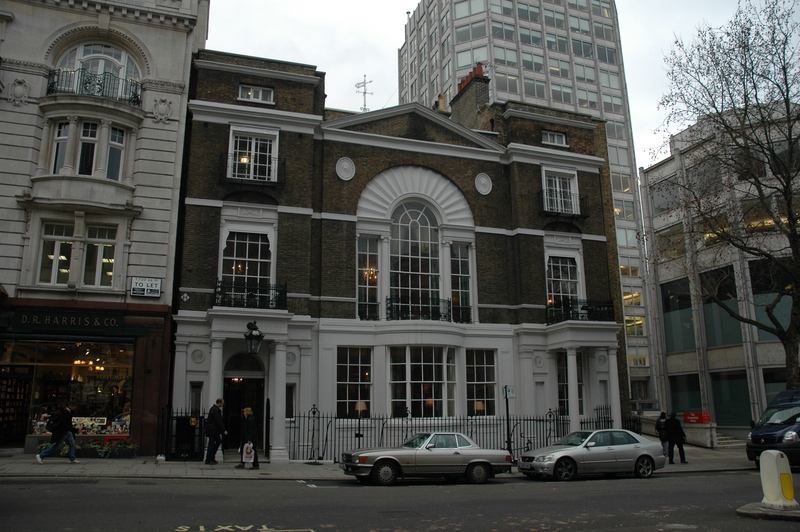 One notable member of the Boodle’s club (along with historical heavyweights such as David Hume, Adam Smith, and Sir Winston Churchill) was author Ian Fleming. 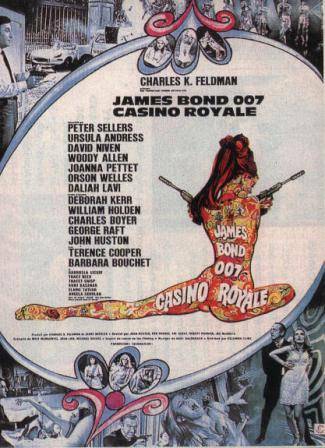 He was so taken by the barkeep’s concoction that he featured a version of the recipe is his first James Bond novel, Casino Royale. 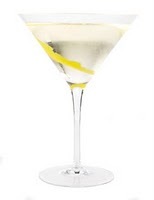 Bond, in the book, claims to have created the drink, and eventually names it the Vesper. This name derived from his untrustworthy love interest, Russian spy Vesper Lynd (her name being a pun on West Berlin). The mixing of English gin and Russian vodka signified the bond between the two spies. After Bond is betrayed by Lynd, he swears off the cocktail forever. 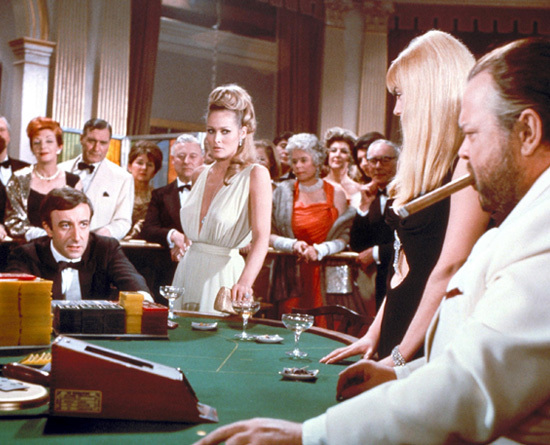 Although the original 1967 production of Casino Royale was a satirical treatment of the novel starring Peter Sellers as Bond and Ursula Andress as Versper, it was popular enough to place the Vesper martini into the cocktail cannon. While many cocktails, ranging from the Mai Tai to the Churchill Martini, have excellent histories, the Vesper Lynd is, as far as I know, the only popular cocktail that was born out of the Cold War-Era tension between Capitalist and Communist alliegances. Years ago a poetry-obsessed friend told me that he’d read an essay in which the author proclaimed “cellar door” to be the English language’s most beautiful pairing of words. I ran the phrase over and over in my mind, but failed to see it as particularly impressive. The image of a weathered door leading to a dank stone cellar is captivating to a degree, but not particularly special. And the words themselves, experienced as phonetic sculptures or tongue exercises, are no more pleasing than countless others. I’d forgotten all about this notion until I recently watched the 2001 film Donnie Darko. In one scene, the character played by Drew Barrymore states, with a gleaming of dull-witted awe in her eye, “This famous linguist once said that of all the phrases in the English language, of all the endless combinations of words in all of history, that Cellar Door is the most beautiful.” Now I had to get to the bottom of this pseudo-intellectual hogwash. Tolkien’s appreciation of the phrase was divorced from its semantic meaning. In fact, according to a later interview, his use of the phrase was meant simply to illustrate the point that some phonemes, when combined in certain ways, are particularly euphonious and served as inspiration for names and places in his writing. Eggplant – More than any other word I know, eggplant forces the speaker to completely reposition his tongue, lips, and teeth in order to switch from the end of the first syllable to the beginning of the second. The word requires a certain acrobatic maneuvering of the mouth, which makes it very engaging to speak aloud. Other good examples of this are dump truck and retrograde, although they are not quite as severe. Atom bomb – Pronouncing this word causes the speaker to essentially play the drums with his tongue. AAH-dum-BOM is percussive in a way that seems to reference the violent force of the object to which the phrase refers. Nariokotome (Pronounced NAH-ree-uh-KOT-uh-mee) – This area, located near Kenya’s famed Lake Turkana, is where, in 1984, archaeologist Richard Leaky discovered the nearly complete skeleton of an adolescent Homo erectus male, dubbed Nariokotome Boy. I am fond of this word because when it is split down the middle, it becomes two three-syllable phrases that play off of each other wonderfully. NAH-ree-uh has a wistful quality, and could have easily been used by Shakespeare to name one of his female woodland faeries. KOT-uh-mee is much more sharp, and does not allow the syllables to lazily blend into one another. It reminds me of a heavy knife repeatedly striking a cutting board. When spoken as a whole NAH-ree-uh-KOT-uh-mee sounds almost like a first and last name, perhaps that of a mythical maiden with a first name denoting peace and mildness, and a family name implying that she comes from a clan of powerful warlords (I guess I’ve caught the Tolkien bug). It is this contradiction that makes the word stand out to me. Anemone – The four syllables of this word flow effortlessly from one into the next, allowing an unbroken hum to accompany the pronunciation of the letters. When spoken over and over in rapid succession (uh-NEH-muh-nee-uh-NEH-muh-nee-uh-NEH-muh-nee…) it quickly dissolves into a chain of playful nonsense sounds, all undertoned by an ohm-like hum. There are countless other words and phrases that are just as pleasing, if not more so, to the tongue and to the ear. I encourage you to reply to this post with some of your favorites. Please describe in detail what you like about them. Nonsense words are encouraged as well. I’m more interested in pronunciation than in meaning.